If you thought that in 2017 you would have a super WiFi internet connection that would fly at maximum speed and that would work perfectly in all the rooms of your house, keep dreaming, things are not so pretty. However, we can significantly improve the performance of the connection we have at home, increasing its speed and avoiding blackheads where it is impossible to connect. To do this, we recommend you take a look at the best ways to improve the WiFi signal in 2017 to get the highest speed possible. Contracting the maximum possible speed that they offer us in our home does not mean directly that we are going to enjoy a better WiFi connection. The equipment provided by the operator, its installation and placement in the home and other aspects, are decisive to ensure the best possible connection. And is that it has been shown that WiFi can cause us to lose up to 65% of the connection speed hired. A few simple changes can be key to achieving the best WiFi connection possible without changing the equipment provided by our operator. The last step will be the irreversible change of the router by a higher quality or updated to the latest WiFi standards that offer better performance. Before we get to that, let’s see what we can do to improve the wireless signal. We propose a series of possible actions so that you can improve the signal of your WiFi network. And why this? Very simple, because although the wireless technology has been improving during the last years, there are still areas of shade where the coverage is plummeting or problems with it, preventing us from being able to continue connecting with the devices to the Internet. We all know the weaknesses or dead zones of our house, and it is frustrating when they appear where we need to have a much stronger signal. Faced with this situation, many people blame the speed of the Internet access provider, and contracts more megabytes, but others do not resign and try to find out the causes and try to give solution. In the latter we will focus on today’s post, so if you are one of the first stop losing your money in hiring a more expensive package when really where you are losing the intensity and speed of the signal is in the air. Yes, we are very heavy on the subject, but it is a matter of vital importance. Router manufacturers often launch regular updates for their computers that improve performance. In addition, even if it is an update that does not improve performance, it will surely have bug fixes or closed security holes. The same will do with the drivers of the network card in the computer. Most current models have the update process integrated into the management interface, so it’s just a matter of pressing the firmware update button. In fact, although the WiFi network is in perfect condition, it is interesting to update the device on a regular basis to avoid future problems. Nor is it a matter of checking daily if there is a new update, but every so often. Some models notify us when there is an update. This way you will get performance improvements, better features and security updates. If you do not know how to access the router to check the firmware version, we leave you a default user collection and password of the most popular models. Many times (most unfortunately) we place the router where it seems most beautiful, where less is seen or where the installer tells us, that moves in certain occasions for convenience. We cannot fall into these beginner errors since the placement of the router is vital for the performance of the WiFi connection, being one of the main problems that slow down the connection. It should never be placed in a corner or near a window, because the signal is dispersed homogeneously in all directions. Therefore, we should always be as “focused” as possible in our home. In this way, the signal will reach all corners more efficiently. Finally, remember that we must keep away from elements that emit waves like cordless phones or appliances. The main key is where we locate the router, and distance is the most obvious problem. Its location often affects the quality of the WiFi signal, so do not just put it on the shelf, think better of placing it on a wall or ceiling. The higher the better. 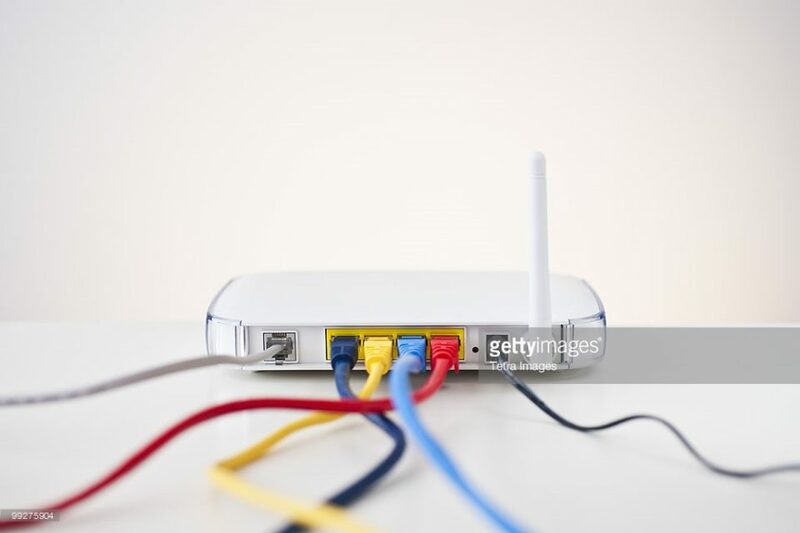 A router to which devices are connected by cable can be hidden, but a WiFi router does not need open spaces, away from walls and signal attenuators. If you have a house with two floors consider placing the device in the second. The magic of the router is in the antennas. It is the part of the device that transmits and receives the WiFi signal. Therefore, it is important to place it in a way that gives better propagation to the signal. In the market you can find a variety of models. Depending on the price the characteristics of some will differ from those of others. Being able to connect to the Internet without the need for cables is fine, but the technology has not yet evolved to the point of exceeding the performance of a wired connection (and you may never get it). Whenever possible, i.e. with the desktop or laptop, we will connect by cable. It is also the best solution in the case of Smart TV where we see Netflix or other content online. In case our laptop does not have network socket, we can buy a cheap USB adapter. If you want the connection to be as reliable as possible, and you have a desktop computer or a laptop that does not move much around the house, the best option is to connect it by cable. Communication is faster than WiFi, there is no interference with microwave waves or some baby monitors. Therefore, if the need to have WiFi is not indispensable for your computer, you can buy and use an Ethernet cable. It is the most reliable option. However, this solution will depend on your needs. Not only will it serve to connect the computer, but if you want to connect a Smart TV to another Ethernet port will also be a perfect choice. 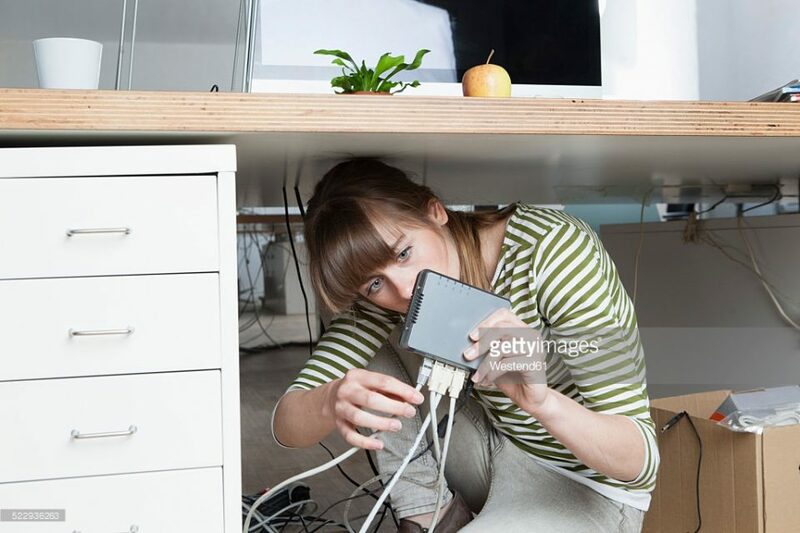 On the contrary, if you want to surf the Internet through your Smartphone from the other end of the house connected to the Internet, you will have to check the WiFi network. How to find out the WiFi password? It is one of the most common searches of Google and not precisely because the user has forgotten his own. Therefore, we must be vigilant to know if they are stealing the connection and we have unwanted guests connected to our network. By accessing our router we can check it or we can also follow the steps of this complete manual. 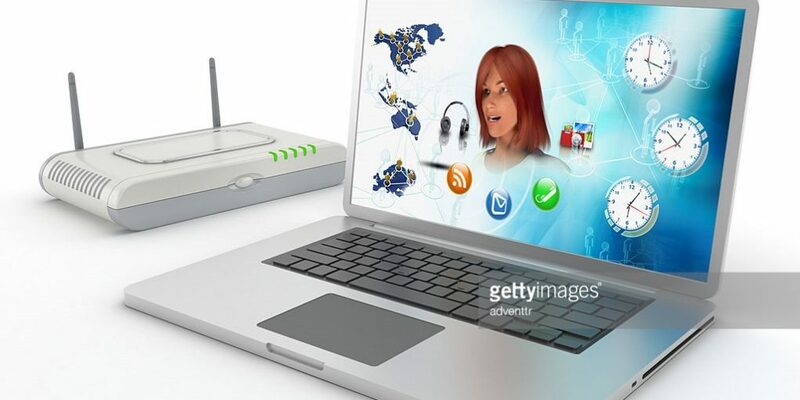 If you already have a WiFi network at home and the router is relatively new, but you still notice problems in signal coverage and quality, you may consider acquiring a WiFi network extender to amplify and boost the signal with a little more force. This device will provide slightly better WiFi connectivity in the more remote areas of your home. We can opt for PLC devices that transmit the signal through the electric network and create a WiFi access point or a traditional repeater. As its name suggests, WiFi network extenders (or repeaters or amplifiers … as you want to call them) simply pick up your existing connection and regenerate the signal with a higher intensity, which retransmit so that more distant places can have a signal stronger. The problem is that the WiFi signal weakens the further you move away from the device. Even so, they are very effective, and many of them take only a few seconds to install. Although it is not a router, you should follow the same rules to find out where to place the extender. It should be close enough to the router to pick up a good signal as well as the weakest areas for the device to send a signal of higher quality. We have already warned you about the almost definitive solution to solve the problems if all previous steps failed. This will consist of buying a new router with better features than the one we currently have. At a minimum, we will ensure that it is compatible with WiFi AC and incorporates technologies that improve performance such as Beamforming. Before launching the purchase of a router, check the 8 keys that you should know beforehand. Have you improved the WiFi signal? If you have a new router, you have placed it in the right place, you have also bought an amplifier so that the signal reaches the dead zones you had at home, but you still see that the WiFi is slow, just the problem is another. Each router comes with a username and password. Therefore, it is possible that the problem is not interference, but the neighbors are connected to the network. Access the router’s administrator interface to see how many devices are connected. And if it is an open network, close it. Set it in a strong password that is difficult to guess. In fact, a good rule of thumb is to change the SSID and password immediately after setting it the first time. In short, first of all, check that your router is placed in the best possible location to have a WiFi connection with guarantees. If it is, and you have a desktop or laptop that does not move located near the router, connect it by cable. In addition, consider the possibility of acquiring a network extender to amplify the signal. And most important of all, check that you do not have a smart neighbor connected to your network!